A new open-source tool helps connect high-resolution sectoral models and broader integrated human-Earth system models. Example inputs (regional and annual scale) and outputs (gridded and monthly scale) of Tethys are shown for the irrigation, livestock, and manufacturing sectors. Enlarge Image. Downscaling of water withdrawals is a fundamental step when integrating large-scale complex human-Earth models with detailed sectoral models. Researchers at the U.S. Department of Energy's Pacific Northwest National Laboratory and the University of Maryland, College Park, developed Tethys, an open-access software package that applies statistical algorithms to spatially and temporally downscale water withdrawal data. Tethys bridges the gap between coarser integrated human-Earth system model projections and detailed sectoral models that require high-resolution water withdrawal projections in space and time. The ability to exchange water withdrawal information when coupling models of different scales is especially important to inform local and regional water resource projections and planning. 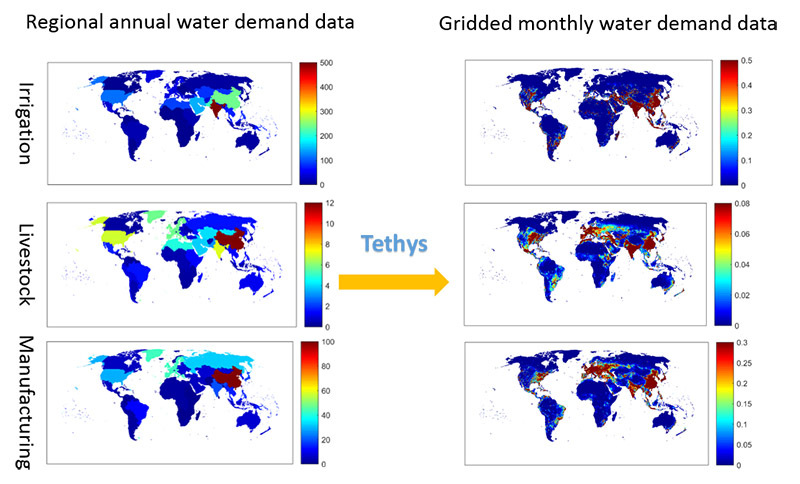 Researchers developed Tethys to produce monthly, gridded global water withdrawal data products based on estimates from the Global Change Assessment Model (GCAM), an integrated human-Earth system model. GCAM is often coupled to sectoral models that typically operate at finer scales, and mismatches across time and space can occur. Tethys eliminates such mismatches by using statistical algorithms to downscale global water withdrawal data. Researchers first separated water withdrawals into six common high-volume water-use sectors: irrigation, livestock, domestic, electricity generation, manufacturing, and mining. They then derived downscaling algorithms parameterized using collected data products and applied them to the various sectors. These algorithms downscaled the spatial resolution from region/basin scale to grid (0.5 geographic degree) scale and the time resolution from year to month. Sponsors: The U.S. Department of Energy Office of Science supported this research through the Multi-Sector Dynamics, Earth and Environmental System Modeling Program.